Cruise & Ferry Interiors celebrates the work of the individuals and companies whose creative genius and hard work has resulted in the most expressive and inspired interiors in today’s passenger ships. 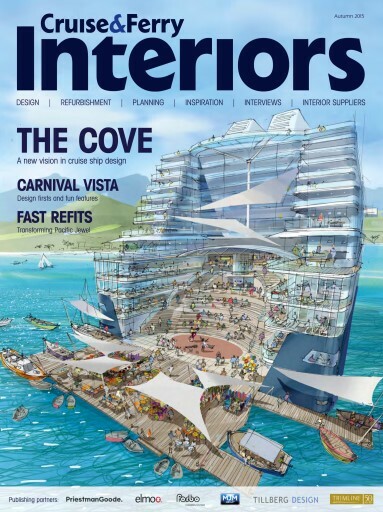 In this issue, some of the greatest minds in passenger shipping interior design share how they manage the constant juggling act between delivering striking and luxurious interiors that impress guests but are also practical. Our cover story features an exclusive interview with Paul Priestman, designer and co-founding director of PriestmanGoode, where we get a chance to hear the thinking behind some of the most innovative onboard design features in the cruise industry. We also speak with the likes of Anna Villem at TUI Cruises about the importance of managing the different functional and aesthetic elements of a room.